The word basset means “low” when referring to the height of a dog. The French developed this “unconventionally attractive” Basset breed of hunting dog; however the modern day breeding took place mostly in England in the late 1800s. Bassets probably descended from the St. Hubert Hound, where a genetic mutation produced a short-legged or dwarfed hound. The “short” dogs were kept and bred when it was shown that they had skills to track rabbits and hare under brush in thick forests. They gained popularity as a hunting dog for small game hunting on foot. The Basset is a very laid back breed. They are very calm, friendly and get along with everyone (kids and other pets included). They are pack dogs, so having another dog or pet around will make for good company for a Basset. Even though they are are a calm breed and may seem lazy, they are a very alert breed and make good watchdogs. Also be aware, due to their hunting ancestry they love a good scent trail and can become oblivious to you when an interesting scent catches their attention. Bassets are a loud breed when they get going. Expect a lot of baying and howling from this breed. They are a heavy shedding breed. They can be slow to train and housebreak due to their stubborn and independent attitude. Bassets are known to have some bad personal habits. Expect a “houndy” odor, drooling, slobbering, snoring and flatulence from this breed. Both pure-bred and mixed-breed dogs have varying incidences of health problems that may be either influenced by genetics or environmental factors. Here are some health concerns that more commonly affect the Basset Hound. Intervertebral disc disease (IVDD) involves disc herniation or rupture, making these vertebral “shock absorbers” unable to do their job. The resulting pressure in the vertebrae can cause pain, nerve damage and paralysis. Bleeding disorders such as Von Willebrands disease and Thrombopathia (basset hound type) are inherited bleeding disorders that can affect Basset Hounds. Affected dogs with either of these diseases will have abnormal platelet function. Suggestive symptoms of a bleeding disorder include nose bleeds, bloody urine or feces, frequent, small bruising on the skin, in the ears, oral cavity or retina of the eye. 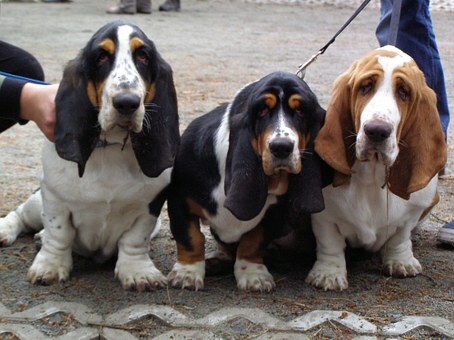 Bassets are prone to developing skin issues due to their skin folds and floppy ears. This can manifest itself as itchiness, recurring ear infections, moist dermatitis or other skin conditions.